I've been exploring the concept of Shared Space in transportation lately and am obsessed with the intersection implemented in Poynton, UK. Shared Space is a traffic concept that gives equal rights to all modes of transportation within the right of way. I can't explain it any better than the clip below. If you like what you see, I was recently able to spend some time with the designer of that intersection, Ben Hamilton-Baillie, at CNU22. His presentation was excellent and in some cases mind blowing. Here it is in its entirety if you are interested. And finally, here's a presentation that I was able to find that does an excellent job explaining Shared Space and providing some additional examples of real world implementations. So, this concept is becoming increasingly popular as it creates place, reduces traffic congestion and increases safety.. When can we do this here in Roswell? The 4th installment of Town Hall | Roswell is tomorrow night at Muse & CO Fine Art. The topic is Building a Walkable & Bikeable City. I'll be doing a brief presentation and then I'll be moderating and participating in a panel made up of Lew Oliver of Whole Town Solutions, Steve Acenbrak of Bike Roswell and Matt Foree of Bike Roswell. Come check it out tomorrow at 7pm. RSVP Here It's free for RoswellNEXT members and $10 for the general public. If you purchase at the door, tickets are $15. Anyway, I saw something a few days ago that I'm honestly shocked I did not pick up on before... Apparently, the city has left riders at one of the more frequented stops literally standing. I walk by here several times a week and more often than not, there are people standing waiting for the bus. 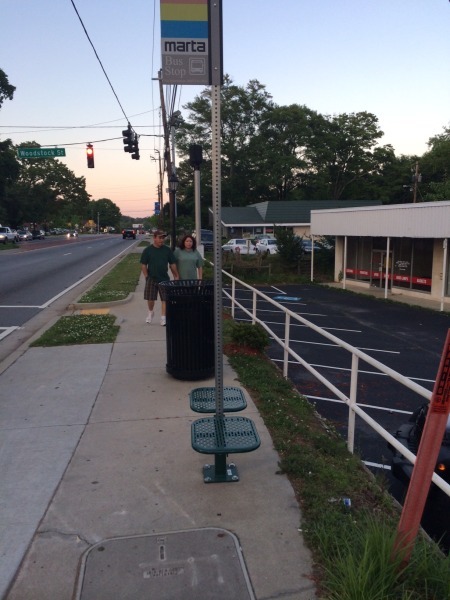 However, just up the road, maybe 200 yards, there's another stop that has two perfectly good Roswell-green seats that I've NEVER seen get used. Humane places don't require that people bring their own chairs to the bus stop. The previous stop pictured could use one of these green seats. I'd say it's time for the city to move those green seats to the right bus stop. Well, unless we want more chairs to be added to the side of highway 9. Or, maybe just add another green seat.